The two top Republicans in the state Legislature are calling on the administrators of the state Ethics and Elections Commissions to resign. 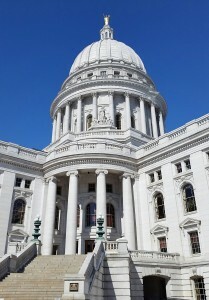 In letters sent Thursday to Ethics administrator Brian Bell and Elections administrator Mike Haas, Assembly Speaker Robin Vos and Senate Majority Leader Scott Fitzgerald argued that there are still “widespread concerns over partisan influence” at both agencies and that their caucuses have lost confidence in their ability to be impartial. As a result, they asked that both men resign. “The voting public must have faith that the watchdog agency of ethics in government can be run without any tint of partisanship,” they wrote in both letters. The request follows the release of a report from the state Department of Justice last week on the investigation into the leak of information tied to a secret John Doe probe, which had been targeting Governor Scott Walker’s campaign and conservative groups. While the attorney general could not identify who leaked records to The Guardian newspaper, he concluded they were likely taken from the former Government Accountability Board. The agency was dissolved in 2015 and separate bipartisan commissions were created to handle ethics and elections issues. The report was also critical of how the new agencies responded to DOJ investigators working to pinpoint the source of the leak, arguing that they did not quickly produce information about where records were being kept and what was in their possession. Both the Ethics and Elections Commissions have refuted those claims, and this week said they support their current administrators. In a statement, Haas said he was surprised to receive the letter and thanked members of the Elections Commission for unanimously showing their support for him earlier this week. He also indicated he has no plans to step down soon. “I look forward to continuing the important work of administering elections on behalf of all Wisconsin residents and taxpayers, and I call on the Legislature to support that work,” he wrote. Bell did not immediately respond to a request for comment.